Honda UK has added a new mode to its range with the introduction of the Accord Sport GT, a new trim/equipment package based on the existing Euro Accord. The European Honda Accord is basically the Acura TSX here in the States. The Sport GT version gets a sport suspension, Graphite-finish alloys (17" for the sedan, 16" for the wagon -- a.k.a. Tourer) and several appearance and convenience upgrades. Those include the Premium White Pear finish shown above, dark chrome grille and door handles, red gauges, carbon fiber-look inlays on the dash and center console, a decklid spoiler, premium audio, nav, Bluetooth, and a few other items. 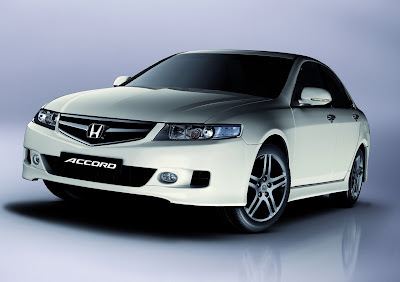 The Accord Sport GT is powered by Honda's 2.2L i-CDTi turbodiesel, which delivers 140 horsepower at 4000 rpm and 250 lb-ft of torque at 2000 rpm. Combined cycle fuel economy is right around 42.8 mpg (US). The car looks pretty good. 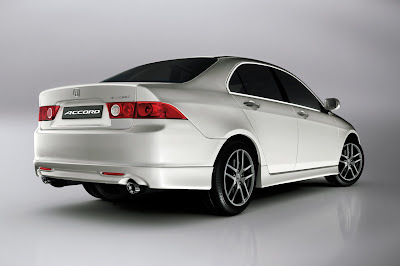 I especially like the rims better than the current style on the refreshed (2006 & after) Acura TSX. I wonder if we're going to see a "Sport GT" version for the Acura TSX anytime soon, however It's more likely that we'll be seeing a "Type-S" version from Acura. [Related] A TSX that gets more MPG than a Prius!